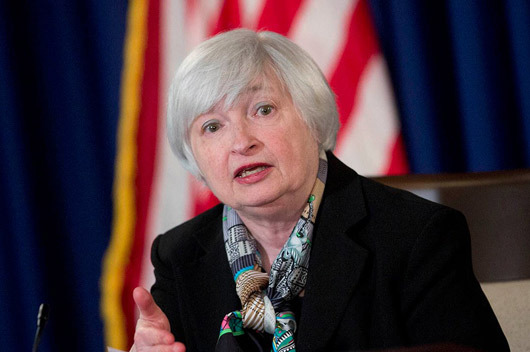 Janet Yellen said the fed would “probably” raise rates in the coming months. Federal Reserve Chair Janet Yellen made it clear that an interest rate hike in months ahead is likely, according to a conversation on Friday afternoon at Harvard University. “It’s appropriate,” said the Fed Chair, “for the Fed to gradually and cautiously increase our overnight interest rate over time, and probably in the coming months such a move would be appropriate,” answering a comment by Havard economics professor Gregory Mankiw. If the Fed plans a hike, the market must be healthy is the general perception as it was before December’s last increase, expressed Savita Subramanian, head of equity and quantitative strategy at Bank of America Merrill Lynch. With the S&P 500 hovering around 2100 and the VIX, the stock market’s panic indicator at 14, the markets were discounting a rate hike in the coming months. After the central bank hiked a bit earlier than had been expected in last December, the S&P slid 10% over the next two months. “Admittedly, other factors contributed to the decline, but history is rhyming, and we think a rate hike this summer could drive some downside,” stated the Bank of America strategist. Interest-rate hikes during a profits recession usually turns out to be bad. Since 1971, the Fed has begun tightening during a profits recession three other times in 1976, 1983, and 1986. Two of those three hikes saw stocks sliding down in the following 12 months. A gap between the Federal Reserve’s initial hike and subsequent ones by a quarter or two generally has been counter-productive for equity returns, expressed the strategist and concluded that regardless of when or if the U.S. central bank makes a move, a raise is just one of the things that the stock market has to worry about this summer. “It is true that analysts currently expect some rebound in corporate earnings in coming quarters, which might lead some to dismiss the negative news on (profit) margins. Indeed, if analysts’ forecasts are realized, our recession-risk tracker could move back down. But we believe that the current squeeze on margins is already putting downward pressure on capital spending and hiring, and it leaves the business sector more vulnerable to other shocks that might arise,” writes JPMorgan economist Jesse Edgerton. Yellen’s Friday statement is likely to put up a bullish rally. The new trading week, after Monday’s Memorial Day holiday, may open with the US Dollar at a two month high. Traditionally, June is a quiet month during the ‘Summer lull’ but with many key events in the coming week and general pressure throughout the month, June may see fairly active markets according to some analysts.